A seemingly simple tip yet it’s somehow difficult to stay true to is to focus on preventing the build during the build phase. For some reason we all want to focus on destroying what has already been built. This is keeping you on the losing end of things always p,aging catchup. It’s much better if you focus on preventing the build in the first place. 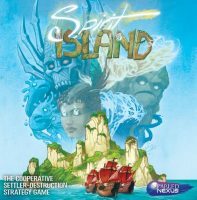 Spirit Island is a heavy game. I’d like to think that we covered everything clearly in the rulebook, but there’s always room for improvement. Eric has created a great FAQ that we continue to build as questions come in. The intent is that you could look something up quickly mid-game without having to search through lots of forum posts. There’s a link/QR code to it on the back of the rulebook. If you find that you still have questions, feel free to post them here, on BGG, or on the Greater Than Games forums and we’ll try to get you an answer quickly (and post it on the FAQ if it isn’t already there).